1988-89 Fleer Basketball might not have the pedigree of the its 1986-87 cousin but it still has one of the best rookie lineups in the history of modern sports cards. Led by some of the first cards from a handful of Hall of Famers, the small set packs a lot of punch. John Stockton, Scottie Pippen, Reggie Miller, Dennis Rodman. Mark Jackson, John Salley -- these are just some of the many rookie cards residing in 1988-89 Fleer Basketball. 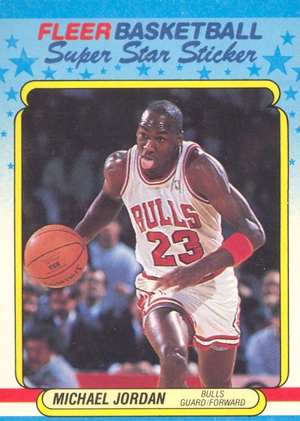 The third-year Michael Jordan card also remains popular with collectors. In total, the base set has 132 cards. Considering its loaded rookie checklist, prices are still very reasonable. By the latter part of the 1980s, print runs for all trading cards were rising fast. This has kept the supply in check. Because of these somewhat soft prices, collectors looking for an investment may want to consider cards graded 9.5 or 10 by PSA or BGS as there is less risk involved than other high-end sets. Unfortunately, the 1988-89 Fleer Basketball design doesn't stand up very well today. Borders are dark in the middle, gradually getting lighter at the top and bottom. The inner frame is colored with rounded corners. The has the player's name in an art deco font alongside the bubbly Fleer logo. The two do not go well together. Even more fonts are used at the bottom of the card for the team and position. 1988-89 Fleer Basketball also has an 11-card sticker set. Super Star Stickers fall one per pack. The checklist is led by Michael Jordan. ** PSA 9 OC! ** 1988-89 Fleer #17 Michael Jordan CHICAGO BULLS! ** BGS 7.5 ** 1988-89 Fleer #17 Michael Jordan CHICAGO BULLS! ** PSA 7 ** 1988-89 Fleer #17 Michael Jordan CHICAGO BULLS! ** PSA 8 ** 1988-89 Fleer #17 Michael Jordan CHICAGO BULLS! ** BGS 8 ** 1988-89 Fleer #120 Michael Jordan All-Star CHICAGO BULLS! 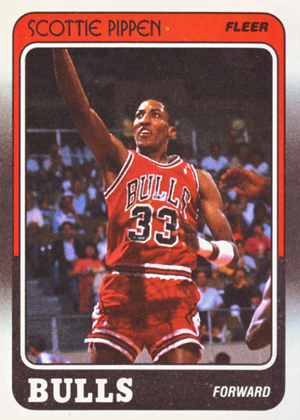 1988-89 Fleer Scottie Pippen rookie! One of my favorite sets of all time. Still reasonably priced with tons of rookies, stars and HOFers. I have 2 jordan super star stickers from the set and both of them are miscut leaning to the bottom right. I just left a card show and a vendor i spoke to there had one displayed that had the same MC. I originally thought they may be reprints but the more i search the secondary market online, the more of that same cut i see. I even saw a PSA9 that had a slight lean on it. Priced for $300 too. Maybe i should submit myself. I googled this set originally to see if fake ones had articles towards the top but to my delight, i saw none. I love this set. It was the first basketball set that I bought and it is loaded with great rookies and star players. The design is not great and player info would have made this a 5 star set.